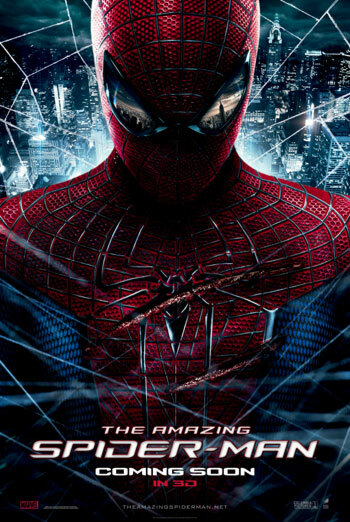 THE AMAZING SPIDER-MAN is an action fantasy film based on the comic book superhero. It was classified '12' for moderate violence and injury detail. The BBFC's Guidelines at '12A'/'12' state 'Moderate violence is allowed but should not dwell on detail. There should be no emphasis on injuries or blood, but occasional gory moments may be permitted if justified by the context'. During THE AMAZING SPIDER-MAN there are sequences featuring moderate violence which, despite the superhero genre of the film, involve realistic weapons. For example, in one sequence a character grabs a man in the street who has been intimidating a woman, and delivers several heavy blows which knock the man to the ground. As the man's friends come to help, a baseball bat is wielded. In another scene a criminal attacks Spider-Man with a knife, but he is easily overpowered and Spider-Man laughs at the small size of the blade. One scene depicts a man being shot after a robbery and as he lies dying there are close shots of the blood soaking through the man's clothing. A laboratory animal is also seen chewing what appears to be the bloody remains of another creature. Neither of these scenes place particular emphasis on injury or detail beyond establishing what is happening. The film contains a sequence in which a young woman, trapped in a laboratory with a vicious creature, improvises with a piece of laboratory equipment to create a flame thrower. This is done in self-defense in a life or death situation. Bad language including "god" and "asses", plus two uses of "Mother...", also features.